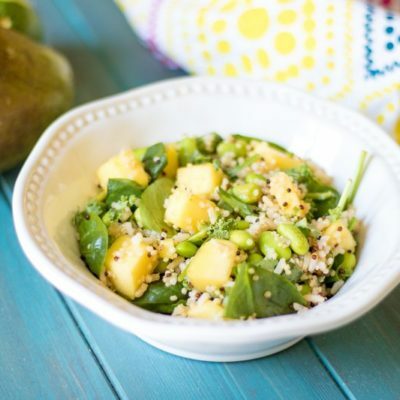 Rice is tossed with sweet and spicy edamame, fresh mango, and lime juice for a delicious Sweet Chili Lime Rice Salad. This easy edmame rice is packed with flavor and protein and makes a perfect side dish or vegan entree. My family is kind of obsessed with sweet chili sauce. We use it to dip our potstickers and eggrolls in and as inspiration for this easy rice salad. This Sweet and Spicy Rice Salad is loved by my picky husband, my middle school boy, my little girl and ME! So you know when you can make a vegetarian dish that the whole family loves–it is a must try! The rice salad is a bit sweet, a bit spicy and oh so fresh thanks to the lime juice and fresh mango. With the added roasted edamame, this rice salad packs a huge punch of protein so whether served as a side dish or a vegan entree, this rice dish will keep you satisfied. This rice salad starts with a base of lime rice, but feel free to use quinoa or a mix of both as well. Bring coconut water (or vegetable stock or water) to a boil. Add in rice and pinch of salt and reduce heat. Cover and simmer according to package directions (about 45 minutes). Once rice has finished cooking, mix in lime zest and 1 tablespoon lime juice. Whisk together apricot preserves, soy sauce, sriracha and garlic together. Roast edamame at 400 degrees for 20 minutes. Toss mango with red pepper flakes, 1/4 teaspoon salt and 1 tablespoon lime juice. Mix together prepared rice, roasted edamame, mango and spinach, if using. Serve immediately warm or refrigerate and serve within 3 days. 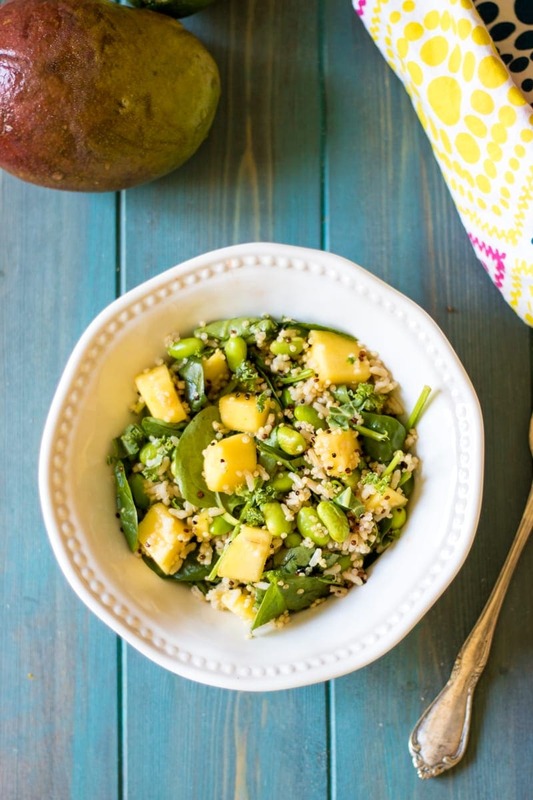 A delicious hearty rice salad made with mango, edamame and seasoned with a sweet and spicy Asian sauce. Bring coconut water to a boil. Add rice and 1 teaspoon salt and let simmer, covered, on low for 45 minutes, or according to package directions. Once rice has cooked, add zest of lime and 1 tablespoon lime juice and mix well. While rice is cooking, whisk together apricot preserves, soy sauce, sriracha and garlic together. Toss with edamame and roast for 20 minutes in oven. 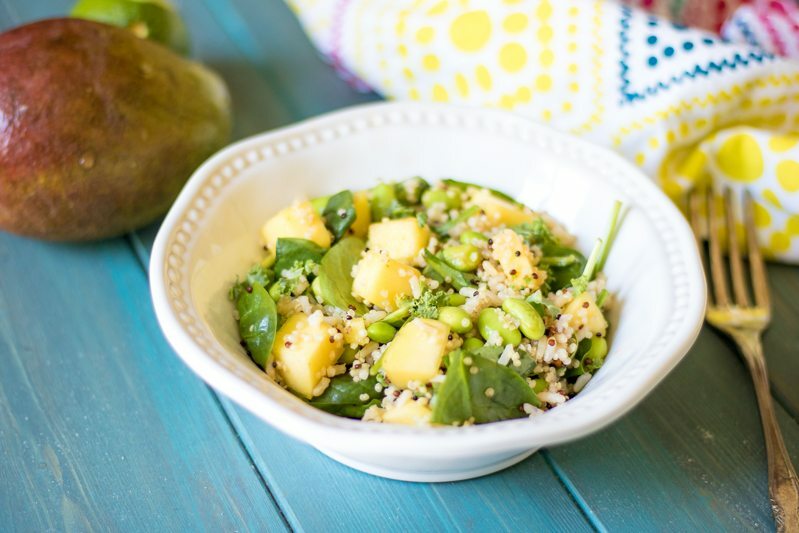 Toss prepared rice with roasted edamame, mango, and spinach if using and serve. I used a whole grain rice and quinoa mixture for this rice salad, but all rice or quinoa works perfectly as well. If using quinoa, decrease cooking liquid to 1 1/4 cups. Serve this rice salad immediately warm or refrigerate and serve within 3 days. Mango just adds so much to so many dishes! That’s an interesting combination I haven’t tired yet. I love the sound of chili and lime. I love mango and edamame too! Wow. I right in there. got to try this.. Sounds yum. Veena, I hope you LOVE it!! It is a different combo, but oh is it SO good! Sia, if your children love sweet and sour, they will LOVE this. And if they aren’t huge fans of spice, omit the red pepper flakes. My kids personally love it. Now this is what I am talking about! Rice is such a staple in our house, and there are so many ways to jazz it up, like this. Yum! Thank Silvia! I agree. Easy and tasty–just the way I like to eat!